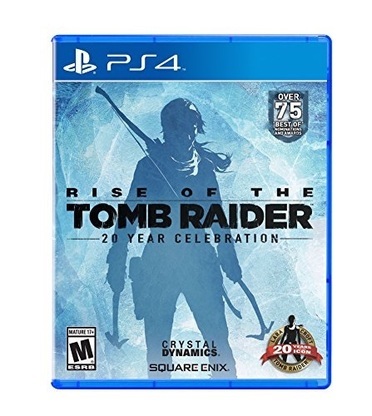 Rise of the Tomb Raider: 20 Year Celebration includes the critically acclaimed Rise of the Tomb Raider, nominated for over 75 ‘Best Of’ awards. With over 50 hours of gameplay and all-new content created to celebrate 20 years of the iconic Lara Croft. This is the most comprehensive version of the award-winning experience. In the critically acclaimed Tomb Raider, Lara Croft was forged into a true survivor, but she glimpsed a deeper, secret world. Now, after uncovering an ancient mystery, Lara must explore the most treacherous and remote regions of Siberia to find the secret of immortality before a ruthless organization known as Trinity. Lara must use her wits and survival skills, form new alliances, and ultimately embrace her destiny as the Tomb Raider. Experience high-octane action moments, conquer beautifully hostile environments, engage in brutal guerilla combat, and explore awe-inspiring deadly tombs in the evolution of survival action. In “Rise of the Tomb Raider,” Lara becomes more than a survivor as she embarks on her first Tomb Raiding expedition. PlayStation VR Support: The full “Blood Ties” story chapter can be experienced in PlayStation VR, and players choose between two control schemes. “Comfort Mode” allows players to teleport from point to point, completely eliminating any potential discomfort. Meanwhile, experienced VR users can select “Free Mode” to move and look around using the thumb sticks. Manipulate HD relics, examine documents, and control the flashlight with the Sixaxis controller motion as you unlock the mystery of Lara’s childhood home in first-person. The immersive HD beauty of Croft Manor is perfectly suited to VR, and for the first time in franchise history, players can explore the world through Lara’s eyes.